The HSLB has been collecting historical materials since 1962. The archive contains more than 100,000 items including documents, maps, photographs, books, scrapbooks, yearbooks, architectural pieces, textiles, uniforms, advertising, menus, postcards, blueprints, publications, phone and address directories, historical inventories, biographies and objects from local amusements such as the Pike and the Shady Acres Miniature Golf Course. Newer collections include the Cambodian Community History and Archive Project (CamCHAP) which will not be publicly accessible until later in 2012 (TBA). You can view collection items on display in the gallery, or by conducting research which is free to members and $25 for those who are not yet members. The following are descriptions of some of the items in our archives. The photographic collection includes snapshots from individuals, partial collections from local commercial photographers including the Winstead Brothers, Lawrence Inman, and A. C. Brown, slides of the Grand Prix and downtown from the 1970s and 1980s, prints from professionals working for the Miss Universe pageant, progress shots of construction of the Naval shipyard, aerial shots of the city and harbor, majestic panorama images, early surfing contests, the Pike and much, much more. In all, the collection includes more than 30,000 images of Long Beach beginning in the late 1800s and continuing to the present. Click here for the Photo Collection page. The collection spans the ordinary to the extraordinary. Among the oldest documents in the collection is a map dating to 1888. We have yearbooks from all of the city’s oldest high schools and Long Beach City College. 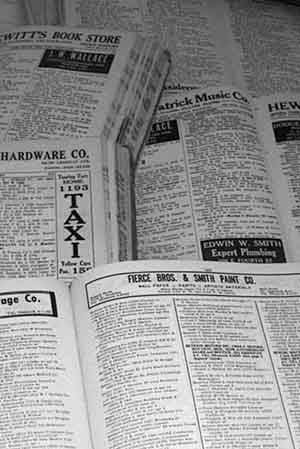 In our collection of city directories, visitors can learn about businesses, research their homes, or locate family members. Books include early city history as chronicled by Walter Case and commemorative publications from schools and local corporations. Among the more extraordinary items in the collection is an obscure and unique scrapbook kept by the Horkheimers who made silent films at Balboa Studios which was located near 7th and Alamitos and was once the city’s largest employer. One of the most important sets of documents in the collection is the correspondence from the city manager’s office spanning the years from 1923 to 1953. During those years, many significant historical events took place including the discovery of oil on Signal Hill and in the harbor, the 1933 earthquake and the buildup of the Navy leading into World War II. All of these events had an impact on the city and their significance is reflected in the city managers’ files. The HSLB collection includes models of the city’s first school and the Pacific Coast Club. An architectural piece from the Pacific Coast Club is permanently installed in our gallery. Other popular objects include knock down dolls from the Pike, a light from the Fox West Coast Theater, signage from around the city and a street light globe from downtown. In July, 2011 after six months of negotiations and years of discussion, the Press-Telegram’s collection of bound newspaper volumes was deposited with the Historical Society of Long Beach (HSLB) for proper archival, long-term storage and public access. This 1,400 volume collection represents one of the richest sources of local, historical materials. It is currently undergoing archival stabilization, and will be made available February, 2012. Please click here for details. Our collections have grown largely from donations by individuals. Whether the case of spring cleaning, getting ready for a move, or, as often occurs when an older family member passes on, children and grandchildren tasked with sorting through a home full of objects, printed material, and memories, the potential exists to make a significant historical find. Sometimes things which may at first glance seem like little more than dated curiosities and ephemera are in fact potential subjects of historical interest. An old company photo perhaps or an image of the city or the beach from a bygone era, a letter from a noteworthy figure, an old menu or map, a uniform, a model or figurine, a yearbook or government, church, or social organization records — all may be of value to a researcher or historically inquisitive member of the public. We encourage you to consider contacting us regarding any items pertaining to Long Beach or Southern California history which you would consider donating to the HSLB. Doing so is one way you can help keep your family’s memories and Long Beach history alive for generations to come.